The article looks at the simulations of the possibility of theft risk occurrences with taking into account different types of cargo, its price and a carriage phase. 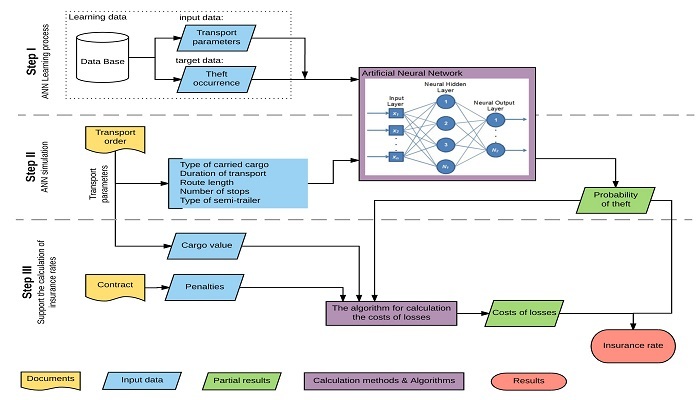 The risk analysis was conducted by using original algorithms developed on the basis of artificial neural networks that take into account, among others, the probability of the cargo theft risk in a particular stage of the order for different types of cargo. The authors specify the forecasted loss values that refer to the type of stolen cargo, including penalties depending on the stage of the carriage. The research and the method described in this article enable the engineers to create a tool/program that facilitates the process of making decisions about additional cargo insurance or the use of monitoring systems for the location and parameters of the cargo. The method can also be used by the insurance companies to determine rates for cargo insurance. K. Bichou, “Security and risk-based models in shipping and ports: Review and critical analysis,” Paris: Joint Transport Research Centre, 2008. M. Celik, S. M. Lavasani, and J. Wang, “A risk-based modelling approach to enhance shipping accident investigation,” Safety Science, vol. 48, no. 1, pp. 18-27, 2010. C. H. Chang, J. Xu, and D. P. Song, “Risk analysis for container shipping: from a logistics perspective,” The International Journal of Logistics Management, vol. 26, no. 1, pp. 147-171, May 2015. J. P. P. Vilko and J. M. Hallikas, “Risk assessment in multimodal supply chains,” International Journal of Production Economics, vol. 140, no. 2, pp. 586-595, 2012. U. Jüttner, “Supply chain risk management: Understanding the business requirements from a practitioner perspective,” The International Journal of Logistics Management, vol. 16, no. 1, pp. 120-141, June 2005. C. H. Chiu and T. M. Choi, “Supply chain risk analysis with mean-variance models: a technical review,” Annals of Operations Research, vol. 240, no. 2, May 2016, pp. 489-507. D. Ekwall and B. Lantz, “Supply chain risk analysis and assessment: cargo theft,” Transportation Journal, vol. 55, no. 4, p. 400, 2016. Transported Asset Protection Association (TAPA) Incident Information Service, “Cargo crime explosion - Annual report 2016,” 2016. D. Ekwall, H. Brüls, and D. Wyer, “Theft of pharmaceuticals during transport in Europe,” Journal of Transportation Security, vol. 9, no. 1-2, pp. 1-16, June 2016. D. Ekwall and B. Lantz, “Cargo theft at non-secure parking locations,” International Journal of Retail & Distribution Management, vol. 43, no. 3, pp. 204-220, March 2015. M. Rausand, “Risk assessment: theory, methods, and applications,” vol. 115, John Wiley & Sons, 2013. E. Zio, “The Monte Carlo simulation method for system reliability and risk analysis,” Springer Science & Business Media, 2013. B. M. Beamon, “Supply chain design and analysis: models and methods,” International journal of production economics, vol. 55, no. 3, pp. 281-294, 1998. G. De Jong and M. Ben-Akiva, “A micro-simulation model of shipment size and transport chain choice,” Transportation Research Part B: Methodological, vol. 41, no. 9, pp. 950-965, 2007. S. Pristrom, Z. Yang, J. Wang, and X. Yan, “A novel flexible model for piracy and robbery assessment of merchant ship operations,” Reliability Engineering & System Safety, vol. 155, pp. 196-211, 2016. L. Urciuoli, “Investing in transport security solutions: using the quantitative risk assessment (QRA) approach,” International Journal of Risk Assessment and Management, vol. 15, no. 4, p. 275, 2011. J. S. L. Lam and Y. Gu, “A market-oriented approach for intermodal network optimisation meeting cost, time and environmental requirements,” International Journal Of Production Economics, vol. 171, no. 2, 2016. Triumph Insurance Group, “2016 First Quarter Cargo Theft Statistics,” https://www.triumphbancorp.com/newsfeed/2016-first-quarter-cargo-theft-statistics/, June 2016. A. Lorenc and M. Kuźnar, “Risk and costs evaluation in intermodal transport - variance analyze of using cargo positioning and parameters monitoring systems,” 2016 5th IEEE International Conference on Advanced Logistics and Transport, Krakow, Poland : conference guide, June 2016, pp. 55-60.